Big Gator Tools are very well made and thought out. They are simple tools that will have a huge impact on the work you do! Being able to create holes, threaded or not in virtually any material is a huge help when building or repairing things. But all too often we have been forced to rely on eyeballing the drilling process or standing a square up next to the drill and making ourselves believe that the hole really will be straight when we are done. We all know that those beliefs turn out to wrong, often by a bunch of degrees and just as frequently on two different planes. The Big Gator Drill and Tap Guides are compatible with hand-held drills of the drill press. By capturing the bit they prevent bits from walking off round stock and to insure that taps enter your drilled holes squarely. An increasingly important factor about these products is that Big Gator Drill and Tap Guides are 100% Made in America! Big Gator offers a selection of precision-machined Drill & Tap guide blocks that are formed from a special nickel steel alloy that has been heat-treated to make them as durable as they are useful. 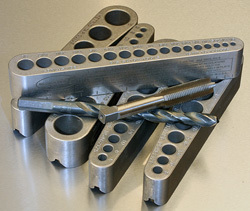 Each has a range of holes bored into them that fit common tap and drill sizes. The bottom of each guide has been ground flat to be sure that it is perpendicular to the holes. The bottom surface also has a V-groove machined into it that makes using these guides on round stock a no-brainer. All of these guides have this V-groove (left) machined intot he bottom surface that allows setting them on rounded stock securely. Each of the Big Gator Guide comes in a protective plastic tube/case (right) that helps keep them protected. A nice thing about the Big Gator Drill and Tap Guides is their overall dimensions. There isn’t a bunch of wasted stock surrounding the holes but there is plenty of high-end material to insure long time strength and durability in the shop environment. The V-DrillGuide™ is only 5-1/2”-long, ¾”-wide at the big end and about 7/8”-tall. A nice size to store in a drill bit drawer in the tool box. 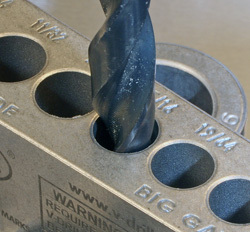 The V-DrillGuide™ also has hash marks along one side that correspond with the center of each drill hole to make locating the holes accurately rather easy. Because the top and bottom surfaces of l of the Big Gator Guides are parallel, clamping them in place on flat or round stock is simple. All of the Big Gator Guides are nicely machined which helps make them easy to use and accurate. Big Gator Tools makes several types of guides to handle just about any kind of drilling and tapping the hobbyist or even pro shops will need in most cases. All are Made in America and carry a lifetime warranty. Of course to sustain the warranty you do have to keep up with the suggested maintenance which is “Oil frequently to prevent rust.” Being such sticklers they probably don’t allow you to cut them up or weld them to things either. At this writing Big Gator Tools makes several types of guides. 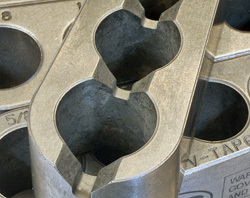 The holes are precisely made to fit the listed drills (left) and taps (right) to insure producing square to the surface results. 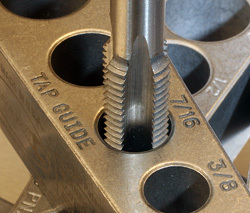 They also have several Tap Guides with holes sized for ANSI Standard and Metric Ground Thread Taps. Whether we are working with metal or wood, drilling and tapping straight holes for fasteners is crucial to making projects, jigs and fixtures that work as we want them to. If a fastener hole is drilled or tapped crooked it cannot hold anything straight which will compromise strength and accuracy. Like many of you I have tried holding a square up to a hand drill which sometimes works on one plane but can be dramatically off 90-degrees to that and we can’t see that at all until after we are done. I used the Big Gator Guides in this review on both wood and metal and found them equally easy to use on both materials. I easily produced straight, cleanly drilled and threaded holes. Even when I was just drilling a pilot hole for wood screws using the Big Gator Guides insured that the screw actually went in straight. That means less cracking or pulling the parts out of alignment. The Big Gator Guides are simple tools that are simple to use yet can have a sizeable positive influence on the work you do. The Big Gator Guides are nicely made tools, produced entirely in the United States yet they come at a surprisingly decent price for the quality you get. 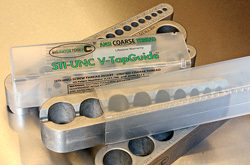 The V-DrillGuide sells for $24.95 and the remaining TapGuides each cost $22.95! (3-24-2012) That is short money for a lifelong tool that most of us will use a bunch. Each Big Gator Guides comes in a durable plastic case that along with a little oil now and then will keep them alive longer than we are likely to be.